How do you know if an advertising campaign is successful when your ad is running in multiple places at once? You have to use something called an Ad Tracker. Ad tracking software easily tracks the effectiveness of the ads you purchase. And helps you quickly measure things like ROI, ad spend and advertising budgets based on campaign effectiveness. How does an ad tracker actually work? It’s amazingly simple. 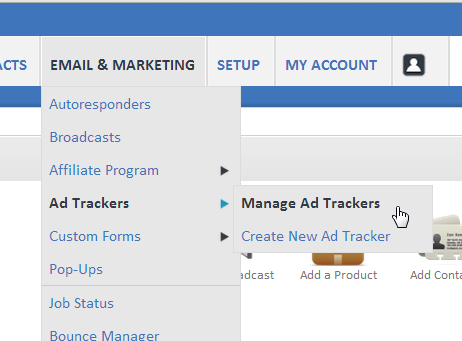 When you purchase advertising or any other URL you want to track, simple create a new Ad tracker in your 1AutomationWiz control panel. Next use the special tracking URL we give you in place of the original URL you were going to use in your promotion. Now, whenever you place any online ads, instead of pointing the link directly back to your site, point it to your new Ad tracker. Once you’ve done this, way we can generate a report how many actual visitors are coming to your site via that ad tracking link. How do I set these up within 1AutomationWiz.com? Want a video walk-through? Watch this ad tracking set up video to see how to set up your own ad trackers. P.S. Your account comes with unlimited ad tracking capability so you can test multiple ad sources and or advertising campaigns at once.